You are here: Home / Discover / Products / Metropole Flatware Has Arrived To Our Metropolis! 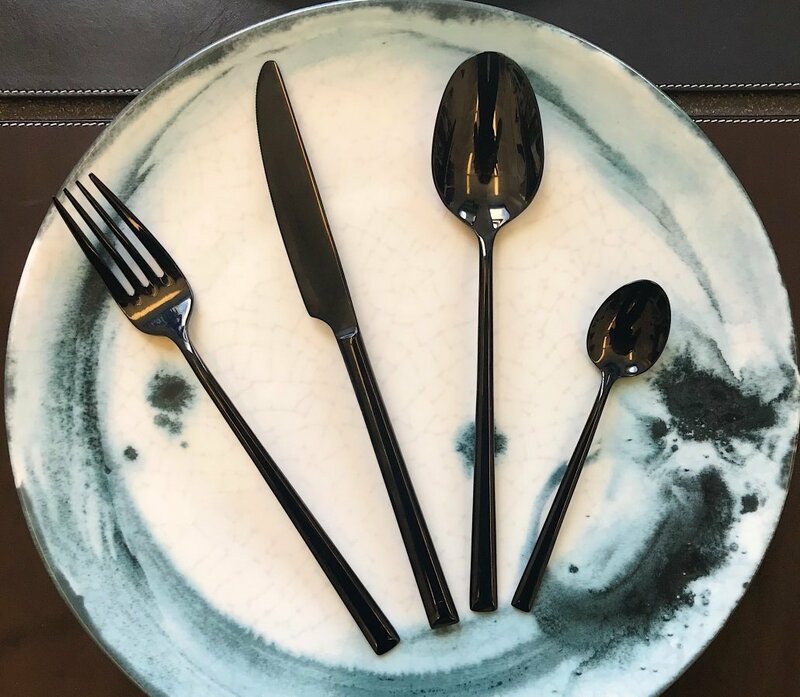 Metropole Flatware Has Arrived To Our Metropolis! When constructing your tabletop, think of Metropole as the steel beams framing your design. Our latest collaboration with Amefa is a collection of high-gloss 18/10 black stainless steel flatware, reflecting the striking urban architecture that surrounds us. This city-chic, substantially-weighted, eight-piece collection is now exclusively stocked at M. Tucker. Metropole features long, slender lines with perfectly smooth, sloping handles. The aesthetic is elongated like the spire of a skyscraper, while the weight brings substance and gravity. Like a little black dress, this collection goes with anything. Designed to draw guests’ attention inward while also adding interest and polish to the tabletop. Metropole adds elegant contrast to the tabletop and keeps food in focus. Flatware photographed on Cove dinnerware by Tafelstern. For product inquiries, please email lmt@singerequipment.com. https://lmtprovisions.com/wp-content/uploads/2018/06/metropol-black-amefa-lmt-cove.jpg 2603 2985 LMTprovisions http://lmtprovisions.com/wp-content/uploads/2018/11/LMT-Email-SM2-002-1.png LMTprovisions2018-06-28 08:00:352018-12-14 13:56:57Metropole Flatware Has Arrived To Our Metropolis!